Oregon has 9 lighthouses along its beautiful coast line. 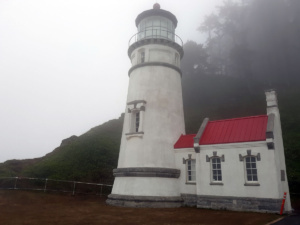 Camping along Hwy 101 and visiting these lighthouses, makes for an educational as well as scenic trip, taking you back in time. Lighthouses. Lonely sentinels, shining their life saving beacons on dark nights through stormy weather. What is their allure and mystique? Could it be they are towering monuments to our maritime heritage and the hardworking lighthouse keepers that kept their beacons lit, to show the way to mariners working to find their way along a treacherous coast line? Most of the Pacific coast lighthouses were designed and built by the U.S. Army Corps of Engineers between 1870 and 1896. Modern technology has replaced these stalwart structures with automated beacons, installed by the Coast Guard. The majority of these lighthouses have been added to the National Register of Historic Places, hosting millions of visitors, intrigued by the past they represent. 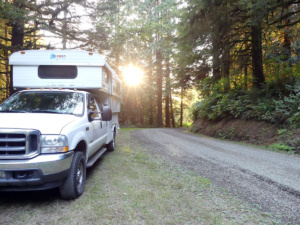 While camping in Oregon, after visiting the Tillamook Cheese factory, we headed south on the 101 to our next camp spot, just north of the Big Creek Bridge, turning onto Big Creek Road. This back country road is located in between the towns of Yachats and Florence. There are many turnouts along this gravel road, where we saw other dispersed campers. The spot we chose was heavily forested and quiet, other than a passing pickup, having fun sliding around the corners with his music playing full blast. This was a reminder to be aware of personal safety when camping in strange, remote surroundings. No fires are allowed and there is NO cell service on this curvy back road. Though this picturesque lighthouse was closed for renovations, we enjoyed a half mile hike in the fog to see the grounds, where a unique Bed & Breakfast venue is part of their operations. Haceta has a 56 foot tower sitting on a point, 205 feet above the ocean, built in 1894. The beacon shines 21 miles out to sea and boasts the strongest light on the Oregon coast. A day-use parking permit is required. Learn more about what to explore on their website. We drove about another 30 miles south to explore the next lighthouse on the coast line. There are huge sand dunes all along this section of highway, with numerous developed campgrounds. Our stop at this lighthouse, museum and gift shop made for a special treat. 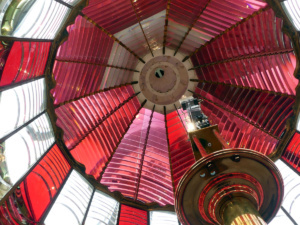 We were able to go on a guided tour and climb up the winding staircase, into the lantern room for the 1st Order Fresnel lens, made with stunning red and white glass. Lighthouse staircase with the weight for turning the beacon hanging down the center. Fresnel lenses came in various sizes or “orders,” 1st through 8th, with the 1st Order being the largest. This multi-faceted glass lens can refract and reflect light to create far reaching beacons of guiding light. 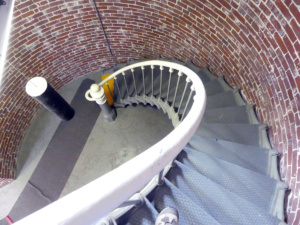 Learn more about the inner workings of lighthouse beacons. 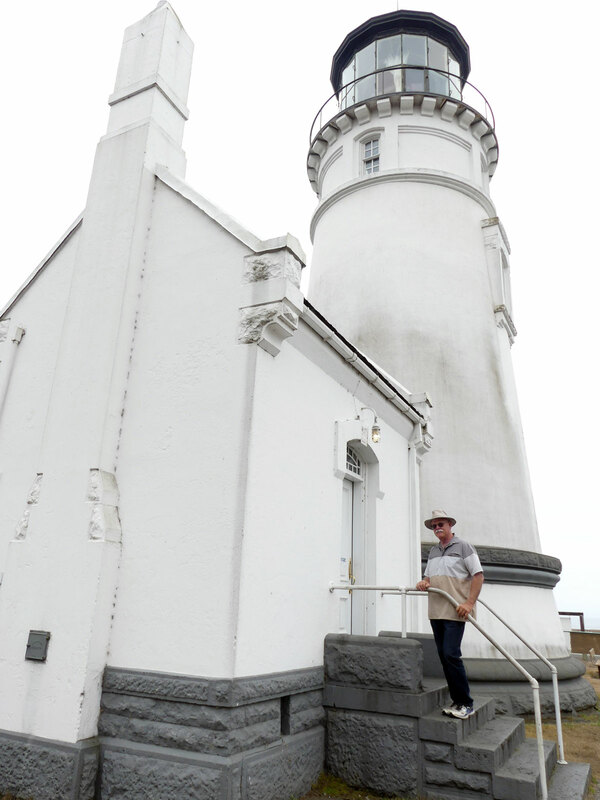 This historic site was where the 1st lighthouse was built on the Oregon coast in 1857. The original Umpqua River Lighthouse had to be replaced in 1861, with the only red and white “character” lighthouse on the Pacific. Back on Highway 101 heading south, we stopped at the Tugman Campground to refill our camper’s water tank. 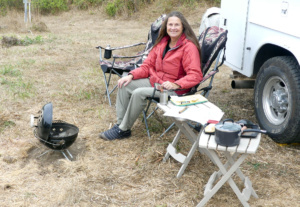 There are many developed campgrounds along this section of Highway 101. However, we discovered a lovely place just off the highway, 1/2 mile north of Arizona Beach and Prehistoric Gardens. We found an area marked “SAA site” on a small, gravel road, running downhill and parallel to the highway. Equipment here is used to monitor earth movement. Here we had a view of the Pacific among the blooming sweet peas and wild berries (end of summer in August). Ready to relax at our ocean view campsite. 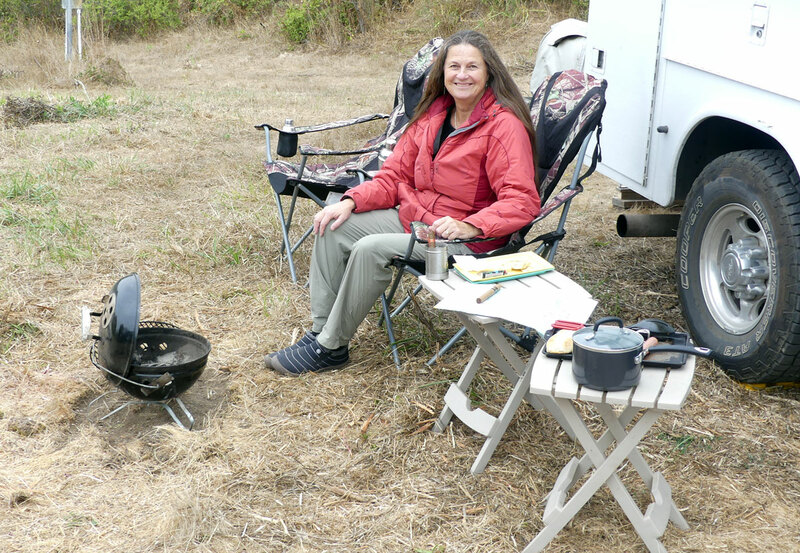 This spot was close enough to the highway to hear traffic, but we parked so that our camper shielded our camp chairs from view, to enjoy our overlook of the ocean to eat dinner and breakfast. The next morning we continued our drive south to Gold Beach. Here we stopped at McKay’s Market to resupply our groceries. This stretch of coast line has interesting and beautiful places to explore. Be sure to stop at the Gold Beach visitor center for info, so you don’t miss out. We visited more lighthouses both in Oregon and California while camping. I will be writing about those, so be sure to check back.